I like to assign myself copywork appropriate to the liturgical season. I make it beautiful with my calligraphy pens, illuminate it, aand then hang the verses and prayers around the house as visual reminders for us all. I think it’s good to model that copywork is a lifelong skill, to help the children to aspire to making their writing beautiful. And we can all use little prayer reminders. This morning Anthony was reading what I’d written and misread “penance” as “peace”. And I realized that if you took out the Ns “penance” becomes “peace”. I shared the insight with my friend Rebecca, but without the context: “Peace is hidden in penance. Just take out the Ns.” She responded that she couldn’t decide it it was clever or trite. And I realized that, especially as I’d written it out, it did look like something that could be shared as an internet meme, complete with pretty picture background. And that framed in that way, it could indeed seem trite. And yet to drill beyond the cleverness, there is a real insight there: that the fruit of penance is meant to be peace. Rebecca said that it would annoy in a meme, but as a secret to look for, it’s different. Peace is a treasure hidden within penance, and perhaps it takes a seven year old who still struggles with sounding out longer words to see it. It’s curious that he’s also currently preparing for his first penance. Another child felt anxious, but it was enough to say that “I feel anxious too,” and hugs and kisses applied liberally and a hand held while walking to the confessional. I peek through the glass— a big picture window as the confessional doubles as a cry room— and watch my children’s faces as they make their confessions. Their earnest faces, so serious, so trusting. They nod, speak, listen, speak again. This is one place I cannot accompany them. They must go alone, speak to our father who hears in secret and hear the words meant for their ears only. Why does confession make us feel so anxious when its end result is peace? Some of it might be performance anxiety, fear of forgetting, fear of saying the wrong thing. But mainly, it’s hard to expose your soul, to put into words your greatest shame, the sins you detest, you want them to not be the things you have done. And yet there they are. And the penance at the end, so simple, so light. It hardly seems to balance with the weight that has been lifted off my shoulders. 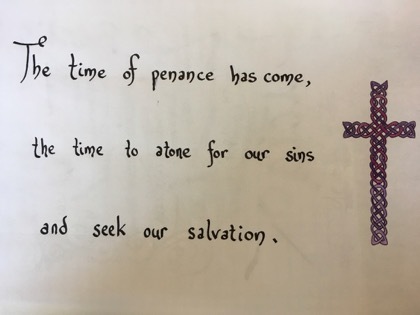 But in this season of Lent when I think of penance, I think less of the sacrament of reconciliation and more of the things I give up and the things I take on. Giving up meat, sugar, snacks. Giving up Facebook, chocolate, rash words, self gratification. Take on spiritual reading, more prayer, acts of service. Spiritual housekeeping. Spring cleaning for the soul. “ There’s no law that you can’t adjust your personal penance mid-stream,“ Jennifer Fitz writes in a most excellent article about adjusting one’s penance: What Makes a Good Penance? 3 Tips for Mid-Lent Adjustments. These are down-to-earth, non-nonsense guidelines for determining whether your chosen penance is realistic or whether you might have over-reached: is it consistent with your state in life, do you have room for more rigor or are you already maxed out, and are you considering real needs of yourself and your family? I especially like what she says about spur of the moment sacrifices and avoiding perfectionism.